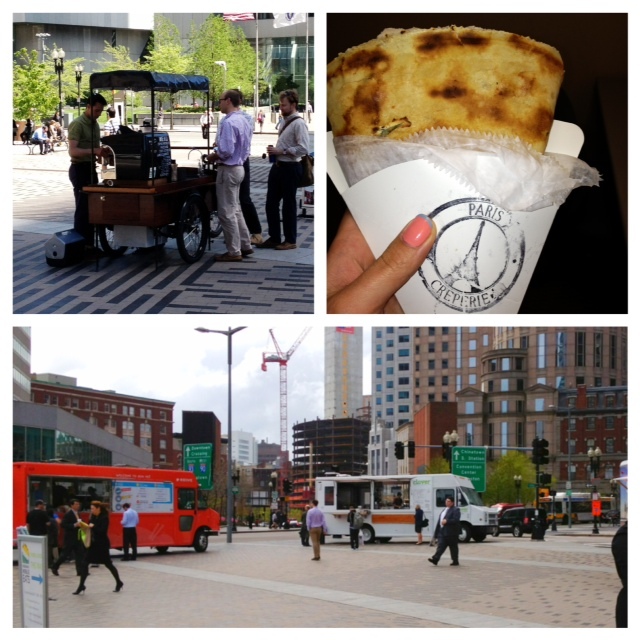 One of my favorite things about the warmer months in Boston are all the food trucks that pop up. I think it is a fairly new concept for the east coast but lt me just say that it's a pretty damn good one! You can get any thing from a taco, to gourmet grill cheese, to a crepe or an organic smoothie - it's mind blowing! Walk out the front door during the lunch hour and the greenways throughout the city are lined with all different types of trucks. 1. Bicycle Barista (top left): That cart is literally attached to a bicycle and he just carts it around. I didnt get the chance to try one, the line wasn't short but I plan to the next time I can track him down. 2. The Boutique Truck: The back doors were replaced with curtain clad french doors, the inside was lined with racks of clothes and 2 dressing rooms. It was just sitting with all the food trucks which I thought was a little rando. I think for this truck time and placement are key, perfect for the happy hour goers at 5pm when they are getting out of work and decide they might be out all night and want a quick change. Cool idea tho! This weeks food truck adventure will be to find the COOKIE MONSTER TRUCK - yes I said it... COOKIE MONSTER TRUCK! Guaranteed food coma but most likely well worth it!